Recently I blogged about my son Todd and his delightful wife Amy going on another multistate bike ride. HOW ABOUT SOME FOLLOW UP PICTURES? Charles Mason and Jeremiah Dixon surveyed a disputed border conflict between British Colonies in Colonial America. It forms a demarcation line among Pennsylvania, Maryland Delaware and West Virginia (then Virginia). Since the Missouri Compromise, if you're into history, the Mason-Dixon Line symbolizes a cultural boundry between the North and the South. I was born on the "south" side of the Mason-Dixon Line although my family fought on the Union Side in the Civil War. 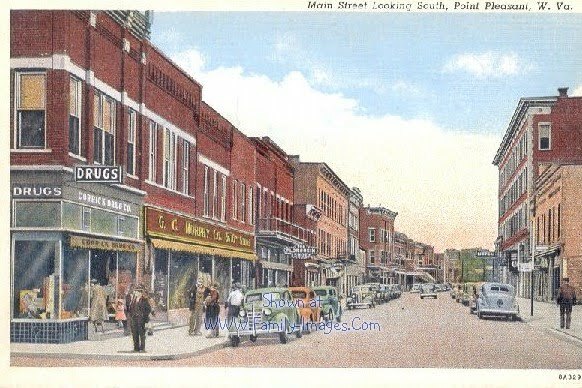 Although I still think of Point Pleasant, West Virginia as my home, I have lived in Northeast Ohio for most of my adult life. "Point" is still "Home". This is the "Point" I left at age 17. We Pierce's get around, but not all by recumbent bikes, although I did ride across California on a recumbent trike. HERE IS AMY AND TODD ON THE PA AND MD MASON-DIXON LINE. My son Mark is also a long distance biker. No, it is not daughter Kimberly's cup of tea. Uh, can you say air conditioned limo? 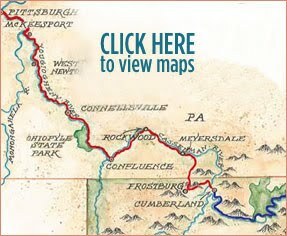 The GREAT ALLEGHENY PASSAGE (GAP) is a 150-mile system of biking and hiking trails that connect Cumberland, MD and Pittsburg, PA. If you are at all familiar with this neck of the woods you know this is an area of mountains. THIS PICTURE SHOWS TODD AND AMY IN THOSE MOUNTAINS. The kids, yes, they will always be "kids" to Dad, made it a 12 day, car camping trip riding 30 miles or so of the trail each day. If it ever falls your lot in life to go camping and must choose a camping pardner, choose Todd. His camp craft is beyond belief. Every line is taut as is every inch of canvas. The camp will shed the weather and the insects. Seating will be good and there will be light to read by. In this picture you see the large bins that contain their camping gear. Trust me, if all your gear is in a canoe pack, the camp will be just as efficient. Too often, after some exciting adventure here or there, I hear people whine "It must be nice. I wish I could do something like that". YOU CAN. As Nike says, JUST DO IT. MID TERM ELECTIONS ARE NOW LESS THAN 100 DAYS AWAY. PLEASE VOTE. Okay...so I'm thinking Kimberly & I definitely have something in common! My idea of transportation definitely includes a smooth ride with air conditioning. And sorry to disappoint you, my idea of camping is the Holiday Inn! haha! For all of my athletic cousins (mostly Pierces), I say, "More power to ya! You GO Guys!" I really am proud of you for all of your endeavors.